In early December 2016, I planned a weekend vacation with my boyfriend, my sister, and her boyfriend, to get away from the NY winter and celebrate both boys' birthdays. On December 18, my sister's boyfriend, Andrew, was involved in a diving accident while we were at the beach. He spent 8 weeks in Jackson Memorial Hospital ICU before he was stable enough to be transferred home to New York, where he would eventually undergo intensive rehab. During this time, we didn't leave his side for over 3 weeks. When we were finally forced to return to New York, we were faced with flying back and forth to Florida on weekends, where we would stay in a hotel close to the hospital. New Perspective Foundation made a possible for us to afford the flight and hotel expenses. We are forever grateful to the foundation for helping us with transportation and lodging so we could be by Andrew's side during such a tragic time in his life. On July 29, 2016, my husband Dustin sustained a spinal cord injury, leaving him paralyzed from the shoulders down. We spent 6 weeks in the ICU and another 6 weeks in acute care before making the decision to go to the Shepherd Center in Atlanta, Georgia – almost 12 hours from own home in Ohio. New Perspective provided us with gas cards as well as funds for a plane ticket. We are so grateful this foundation helped with our traveling expenses. Aside from relieving us of some of our financial burden, they have been very encouraging and have helped us stay positive, and that is priceless. On October 21, one of the greatest fears parents have, became a reality to my wife and I. Our youngest son, Logan, was on his way to one of his college classes, when he lost control of his truck going around a sharp curve in the road. After 30 minutes, the EMTs were able to free him from the wreckage, but they quickly realized he had no feeling below his chest. Logan was life flighted to a hospital about 50 miles away in Roanoke, Virginia. After a 5-6 hour surgery, we were told he had a "pretty beaten up spinal cord." News like this is very hard for parents of such a vibrant young man. Shortly afterwards, we found out Logan was going to be taken to the Shepherd Center in Atlanta, in order to receive therapy. 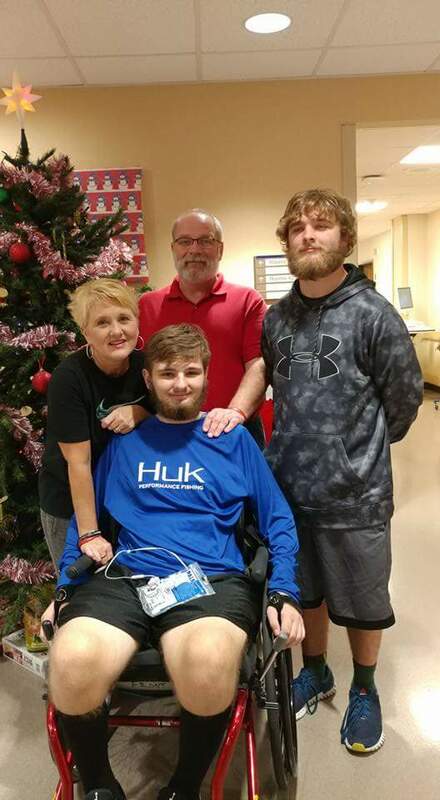 Thankfully, word of Logan's injury had spread and my wife received a call from New Perspective Foundation, saying they could help with our travel expenses with going to be with him in Atlanta. Our plan was that Robin was going to stay there with him and I was going to drive back and forth between Virginia and Georgia, since we have an older son who attends Virginia Tech and I also needed to work. I drive to Atlanta every Thursday and back home every Sunday. With New Perspective providing money for gas and hotel costs, those trips are a lot less expensive and easier to make. One of the biggest blessings in the help from New Perspective Foundation, is their willingness to just talk. The situation is so hard for Logan and us, and they just want to help because they know exactly what is going through our minds. This whole situation is so hard to deal with, but New Perspective Foundation has been a Godsend. It really does show that there are still very good Christian people who will help. We are so thankful for everything they have done and will do. To view our Facebook, search, "Prayers for Logan." In March 2016, my father, who lives in Pennsylvania, was in a car accident that resulted in a spinal cord injury. As a resident of Florida and a recent grad school graduate who successfully landed her first "big girl job," I was JUST getting on my feet at the time when the accident occurred. I did not know how I was going to afford to make it home to support my father in his recovery, but I knew that I would do whatever it took to get there. Out of desperation, I began searching for available financial resources and discovered New Perspective Foundation. I figured it was a long shot I would be granted, but I submitted an application anyway. To my surprise, I received a voicemail from the foundation the following morning, informing me that they were going to help me get home to be with my father. Just like that. For the first time since my father's accident, there were no hurdles to jump over or barriers to overcome. There was simply a man, on the other end of the phone, letting me know that he was once in my father's shoes. This foundation did more than provide me with financial stability during an extremely unstable period of time, and it did more than allow me to go home to be with my father in the hospital. It was a turning point in my father's recovery in which I grew confident that, slowly but surely, we would get through this. Simply put, New Perspective Foundation brought an immense amount of hope to what once felt like a hopeless situation. For that, I am extremely grateful. Thank you for everything you – didn't – have to do. Thank you so much for the awesome job you do at promoting & helping families of spinal cord injuries. When Austin was doing therapy in Chicago, we thought we would have to shoulder the financial burden of traveling from Ohio and back every weekend. We truly appreciate the help with the driving expenses. It has been a true blessing just to be able to speak with you and have you relate to Austin. I know his challenges are livable because you have done it! We are finding many blessings on this new journey in Austin's life. Thank you for being one of them! My oldest brother was riding his bicycle when a driver ran a red light at a crosswalk and hit him. He immediately knew something was terribly wrong, as he could not move his entire body. Joe's injuries were very severe, including 17 staples in his skull, a crushed eye socket, broken nose, a deep laceration on his arm, compound fracture of his tibia, and many scrapes and bruises. The worst of it all was a crushed C6 & C7 vertebrae, which left him paralyzed and in a wheelchair. I live in Kansas and Joe went to rehab in Colorado for six months before going home to Florida. This was not an easy trip to make. I heard about New Perspective Foundation and they have helped with my travel expenses. I'm so grateful to have had the help when I least expected it and needed it the most. They are wonderful people and this is truly an amazing organization. I cannot thank them enough! God bless all that they do! On December 17, 2015, I received a call from my brother's girlfriend – it was one of those calls that you instantly knew something was wrong. Joe was on his bicycle, taking his dog for his usual walk, when a lady ran a red light going 45 mph and struck Joe on his right side, leaving him paralyzed from the chest down. After three surgeries and local rehab, Joe was presented with an amazing opportunity to travel to Colorado and continue rehab at Craig Hospital. New Perspective Foundation was quick to respond after Joe's story was submitted to their website. With their help, we were able to plan a trip from Wichita, Kansas to Englewood, Colorado so we could be there for Joe and Tracy at Craig Hospital. New Perspective Foundation is a truly humble and kind organization to allow such an opportunity to families who are going through such difficult times. It's not often that people are willing to help strangers, especially in such a big way. Our family is beyond thankful for all the support as Joe continues to go forward on his new journey in life.